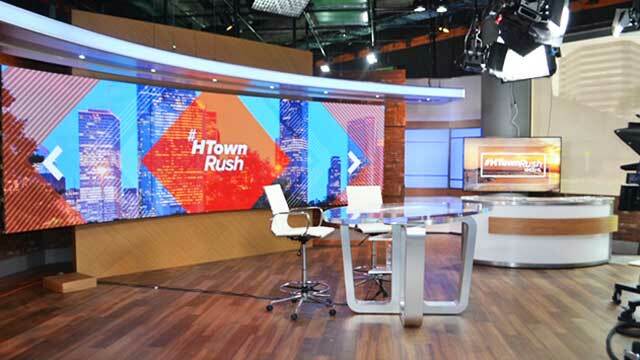 KHOU 11 announced it will begin occupying its new space at 5718 Westheimer beginning February 10. The station’s first newscasts from the new location are expected on February 17. Unless you have been living under a rock, you know that the KHOU studios on Allen Parkway near downtown Houston were destroyed thanks to five feet of water flooding the building during Hurricane Harvey. Since then, the staff has been broadcasting from Houston Public Media's building. The new channel 11 at 5718 Westheimer near Bering is 43,000 square feet of space with two large studios. Trust me, this is way more space than the tiny confines of its former and now demolished Allen Parkway location. "This is more space than we have ever had," anchor Len Cannon said in the video. The news desk that Cannon showed us is one where the anchors stand, not sit behind. This news studio is directly next to Deborah Duncan's Great Day Houston studio. Like KPRC 2's new newsroom, the KHOU one will also be next to a huge bank of windows where lots of light will brighten the dark days of breaking news. There will also be a newsroom set for the anchors to use. In the same room is also a lounge area next to the desks. "This is like the hippest lounge in town...it's a lounge minus the drinks I guess," joked Cannon. Believe it or not, not too far away, Univision 45 also has a lounge, but KXLN's looks like an actual club. As I have blogged before, the Univision Uforia Lounge is used for radio station concerts and live TV productions. I should also note that anchor Shern-Min Chow tweeted that this was the last day for KHOU general manager Susan McEldoon. Chow posted a video of McEldoon talking to the staff where she said on her final day champagne was served in the department head meeting. "It's just been such a privileged to be your GM," an emotional McEldoon said in the video to the newsroom. "There just aren't words, so thank you all for making me feel so special." As I blogged last March, McEldoon postponed her retirement due to Hurricane Harvey's destruction of the station's old building. Later in July, owner Tegna announced Bobby Springer, the director of advertising and promotion at 9NEWS KUSA Denver would replace her. * This post was updated on February 8, 2019 to include information from a press release KHOU sent me with new move date information.